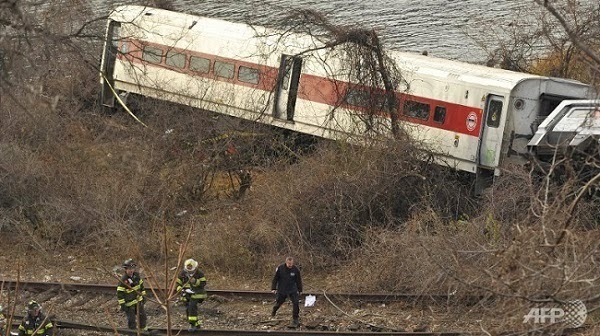 A train hurtled off the tracks in a New York suburb yesterday killing at least four people, injuring 67 and coming perilously close to plunging into a freezing river. Emergency services launched a major rescue operation after the train careered off rails in the Bronx district as it headed for Grand Central station in Manhattan. 4 people were killed , 11 were seriously injured while 56 people had minor wounds. Officials said some passengers were injured by debris as carriages flew into the air, while others had to be cut free from tangled metal. Many passengers also suffered broken limbs or injuries to their heads or necks, with some being led away with bloodied faces. Some passengers have said the commuter train was going "a lot faster" than normal as it went into the bend. The driver survived the crash and police have said he will be questioned by accident investigators soon as he gets better with his treatments.